This child was among thousands of Iraqis who fled to the high-altitude region of northern Kurdistan during the winter of 2014 with nothing but the clothes on their backs, and found themselves entirely dependent on humanitarian agencies. Not since the Second World War have global humanitarian needs been so high. From the crisis in Syria and the drought in Ethiopia, to the conflict in Sudan and the violence in the Lake Chad Basin, more than 125 million people around the world whose lives have been devastated by conflict and disaster desperately need humanitarian aid and protection. 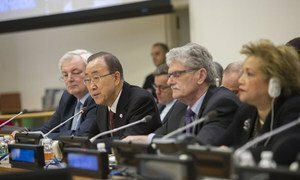 Inspired by his own experiences of war, and knowing that today’s challenges are global, borderless and beyond the capacity of any one country or organization to resolve, Secretary-General Ban Ki-moon will convene the first-ever World Humanitarian Summit on 23 and 24 May 2016 in Istanbul, Turkey. The Summit – a culmination of three years of consultations with more than 23,000 people in 150 countries – will be an opportunity for leaders from governments, aid organizations, crisis-affected communities, the private sector and academia to come together and commit to take action to prevent and end suffering, reduce the impact of future crises and transform financing to save lives. Ahead of the Summit, the Secretary-General presented the Agenda for Humanity, which outlines five different areas requiring collective action that, taken as a whole, provides the key actions and strategic shifts the world needs. Unless political leaders show the will to prevent and end crises, little will change for the millions of children, women and men who are caught up in these crises. Leaders – including UN Security Council members – must put compassion and courage at the heart of their collective decision-making. They must analyse the risk of conflict and act early to nip conflicts in the bud. They must use all the leverage they have – political, economic and otherwise – to prevent conflicts and find solutions. And they need to put aside divisions to invest in peaceful and inclusive societies. Abu Mohamed, a former engineer, showed UN staff around his house in Sana’a, Yemen. Everything had been destroyed. When asked what he needed most, he stated: “Safety. That’s the only thing we need. Safety and protection. All the rest is not as important. Unless international humanitarian and human rights laws are respected and monitored, and unless violators are held to account each time they break them, civilians will continue to make up the vast majority of people killed in conflict and their hospitals, schools and homes will continue to be obliterated. In addition, civilians will continue to be trapped by fighting parties and aid workers will continue to be barred from accessing them and will be putting themselves in danger when they try to do so. Imagine being one of the most vulnerable people in the world. You’ve been forcibly displaced, or drought has killed your harvest for a fifth year running. You are stateless, or you are being targeted because of your race, religion or nationality. Now imagine the world says that none of these people will be left behind—that the world’s poorest will be targeted in development programmes, that world leaders will work to halve displacement, that women and girls will be empowered and protected, and that all children – whether in conflict zones or displaced – will be able to attend school. All of this could be a reality if leaders abide by these commitments. Dr. Bishal Dhakal sprang into action within hours of the 25 April 2015 earthquake in Nepal, becoming the first Nepali doctor to reach Barpak village in Gorkha, the epicentre of the quake. Emergency response was in his blood. By the second day after the quake, he had recruited 10 volunteers; by the fifth day, he had 2,000. Sudden natural disasters will take us by surprise, but many of the crises we respond to are predictable. Imagine working with at-risk communities and partners to help them prepare for crises so they are less vulnerable when crises strike. Imagine if we not only collected better data on crisis risk, but also acted on it early. By doing this, we could reduce risk and vulnerability at a global scale. If we really want to act on our responsibility to vulnerable people, we need to invest in them politically and financially. This means increasing funding not only to response, but also to risk and preparedness, to protracted conflicts and to peacebuilding. It means boosting local response through more funding to national NGOs and to pooled funds. It means stopping blocks to crucial investments, such as remittances flows. And it means being more creative with funding, using loans, grants, bonds and insurance mechanisms; by working with investment banks, credit card companies and Islamic social finance mechanisms, as well as with donors. It requires donors to be more flexible in the way they finance crises, and aid agencies to be as efficient as possible and transparent about how they are spending their money.